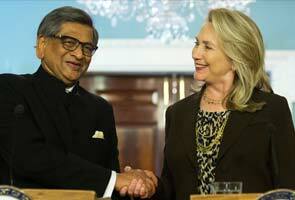 The issue of US visa fee hike, which has hurt several Indian IT firms, is expected to come up for discussion when External Affairs Minister SM Krishna meets US Secretary of State Hillary Clinton here on Monday on the sidelines of the UN General Assembly session. India has “consistently” taken up the issue of the visa fee hike with the US and the issue will figure in talks between Krishna and Clinton, official sources said. The US had raised visa fee in 2010 to fund its enhanced costs on securing border with Mexico under the Border Security Act. Some of the top Indian companies TCS, Infosys, Wipro and Mahindra Satyam were affected by the US action and India is expected to soon seek consultations with the US at the World Trade Organization (WTO) on the issue. The sources said that young Indian professionals working in the US have been the “cornerstone” of India-US relations and are a pillar in the improved bilateral relations that has brought the two countries closer. Hiking visa fees or limiting the number of work visas available to Indian companies is tantamount to “undermining that pillar and growth in India-US relations,” they added. “Raising visa fees and putting other barriers is not in consonance with the forward thinking of growing bilateral ties,” the sources said. This will be the third bilateral meeting between Krishna and Clinton this year. They had previously met in India in April and again in June in Washington. The sources said that the two countries have a fairly elaborate agenda and the visa issue is one of the issues in a broader relationship. Krishna will also address the 67th session of the UN General Assembly today. He would also participate in a meeting to commemorate 15 years of the convention against chemical weapons and the informal meeting of the SAARC Foreign Ministers on October 2.